This is a weekly post where I take time to be thankful for the small extras that made me happy this past week. – Teaching Hadley to jump on the bed on the count of three. This is both cute and convenient. I like to learn new tricks. I'm smart like that. 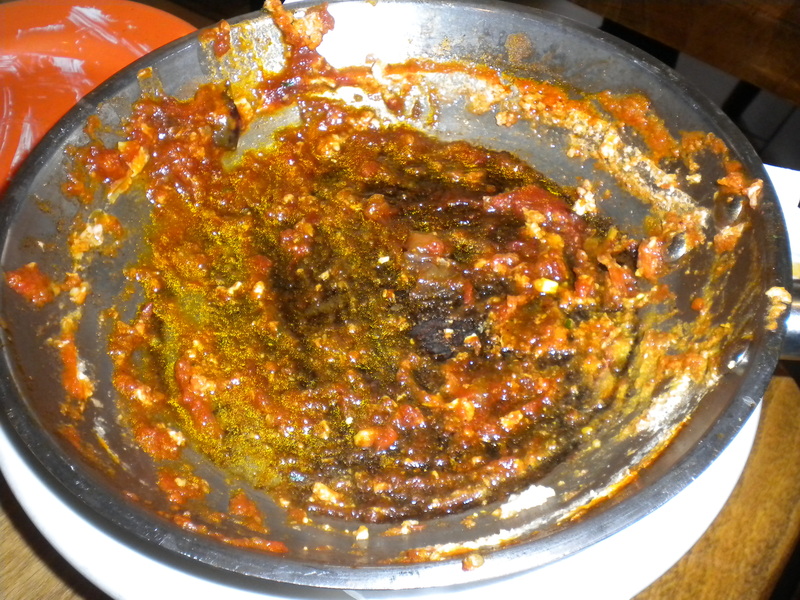 – Trying out a new falafel place near my apartment where I got to add my own toppings. – NYC soaring to 60 degrees on Friday. – Wearing my awesome Nordstrom’s Rack find for the first time. My most favorite heels ever. – Watching Hadley go mud-splashing in the dog park. He needed a bath afterwards, but he had so much fun doing it. – Rocking a denim mini skirt from AE out on Friday. I haven’t been able to wear a denim mini since 1L year. My first purchase off my Spring Wish List. – Having a family sleepover after dinner on Saturday night. 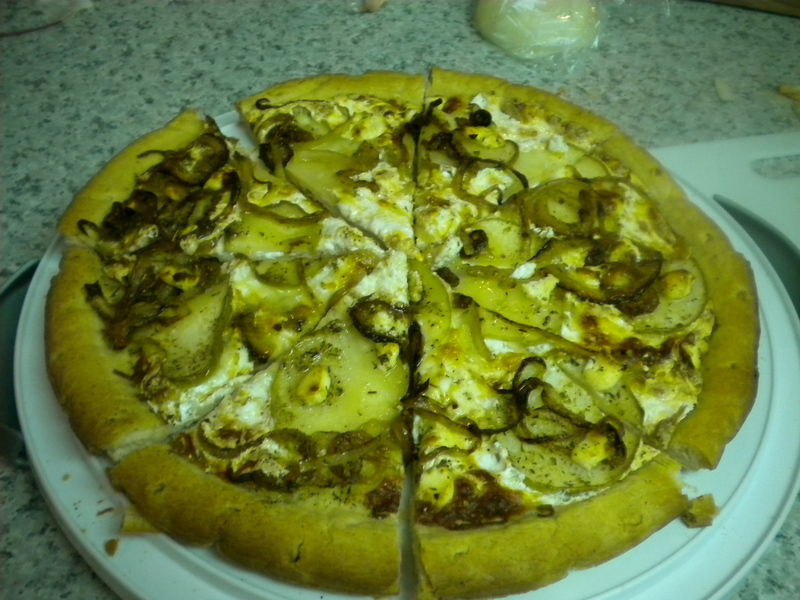 – Enjoying pizza I made in my own oven. – Running my first sub-8 minute mile in probably as many years. – Purchasing the Victoria Secret yoga shorties I have been eyeing for over a month. Pilates makes a tush look good! 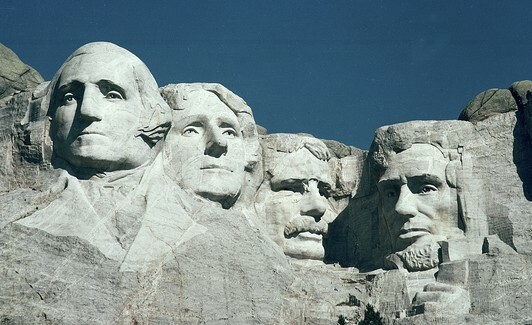 – Having a three day weekend to celebrate our Presidents. What are your loves from this past week? I went to dinner at the Corner Shop Cafe with Chris and friends. It was closed for a year and just reopened. Chris and I started out with their much loved on Yelp Mac ‘n Cheese. Maybe I’m not mac ‘ n cheese cultured, but I prefer my Annie’s. For dinner I had a tuna burger. Good but nothing over the top. If you add in the fact that the we waited about an hour and a half to be served, and they brought the meals out one at a time, I won’t be returning. Still, I was with good friends, so it was still fun. We ended the night dancing at a nearby lounge. I was happy I didn’t go running earlier in the day, because my legs would have never approved otherwise. It was fun to dance – I honestly cannot remember the last time I have gone. Saturday was too fun. I spent the entire day in Lord and Taylor with my mom, aunt, and brother. We even ate lunch there! It turns out their food is yummy. My aunt teased me for taking pictures of my food, but this meal was pretty. 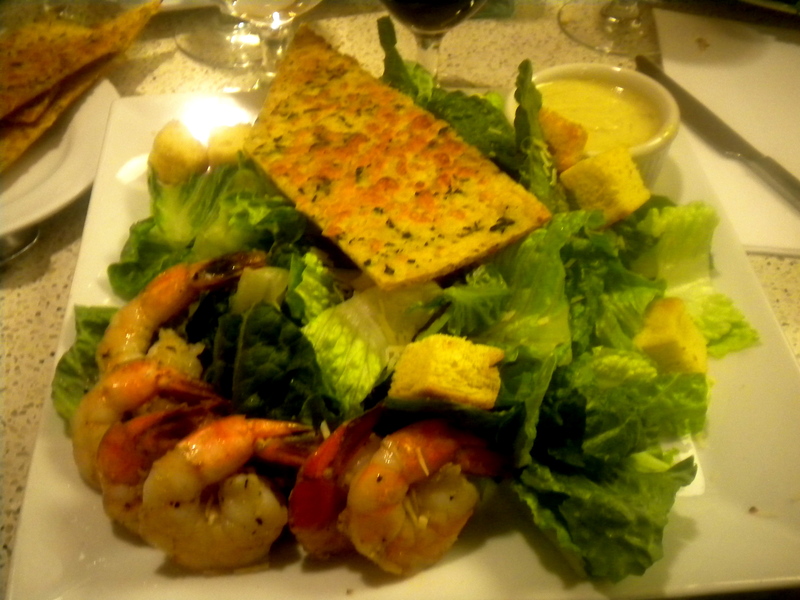 Shrimp ceasar salad and flat bread. 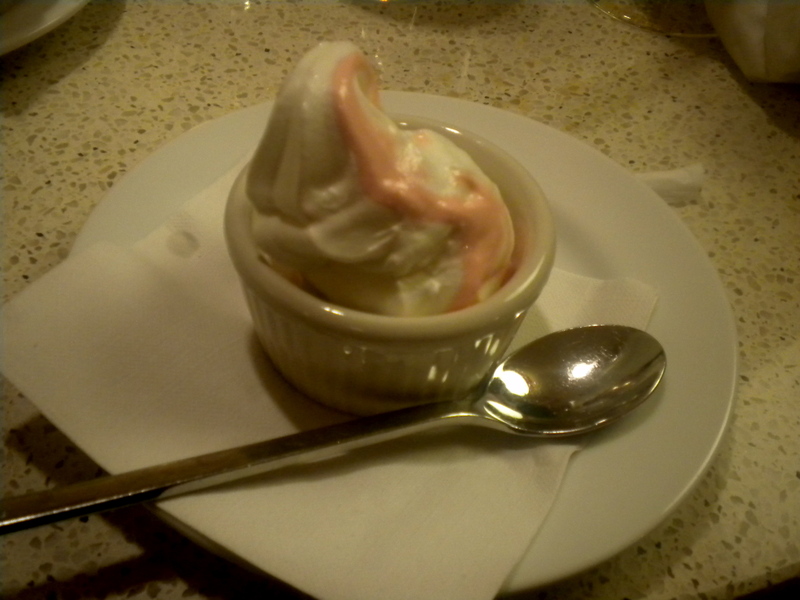 The waitress brought out complimentary mini yogurts for everyone. We spent the rest of the day shopping, but were unsuccessful for the most part. Still, my mom managed to nab a pair of designer jeans marked way down. I was proud of myself for not buying just to buy. I’m telling you, my teeny tiny closet is helpful sometimes. We ended the evening joined by Chris and my cousin at Tavern on Jane. This place is great! I had a restaurant.com coupon to it, which made it even better. The menu wasn’t extensive, but everything we ordered was delicious. The place is small, but not tiny, and they were fine with the fact that we were super late to our reservation. We all shared a calamari app, which was yummy and not greasy at all. For dinner I tried out their seared yellow-fin tuna tacos. This time Yelp reviews didn’t lie. They were oh-so-good. I wish I had pictures, but the place was dark and my little point and shot refused to play along. Perhaps the most fun part of the restaurant is that the table cloths are paper and they provide crayons so you can draw on it. We had enjoyed a very intense game of hang man, in which my cousin didn’t spell the word we were trying to guess correctly. We aren’t spellers in my family. I think more restaurants should let you draw on their table cloths! It was so much fun to be out in the city with my family. Whenever my parents visit, we tend to eat in my apartment, so it was great to go try a restaurant with my mom, show her a new area of the city, and even get her to ride the subway. Successful Saturday! The two themes of this weekend were fitness and food. Well that and celebrating Valentine’s Day. Thursday night I went to my parent’s house in Jersey, because I had a doctor’s appointment in the morning. My mom and I went out to a “fancy” diner, and it really was fancy! They gave us artisan bread to munch on with oil to dip it in. 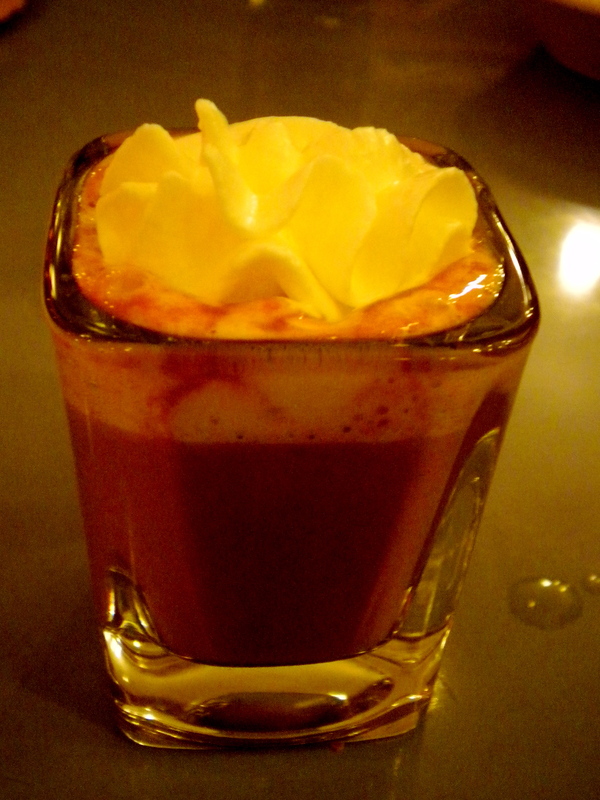 We also got mini hot chocolates on the house with whip cream. Double yum! 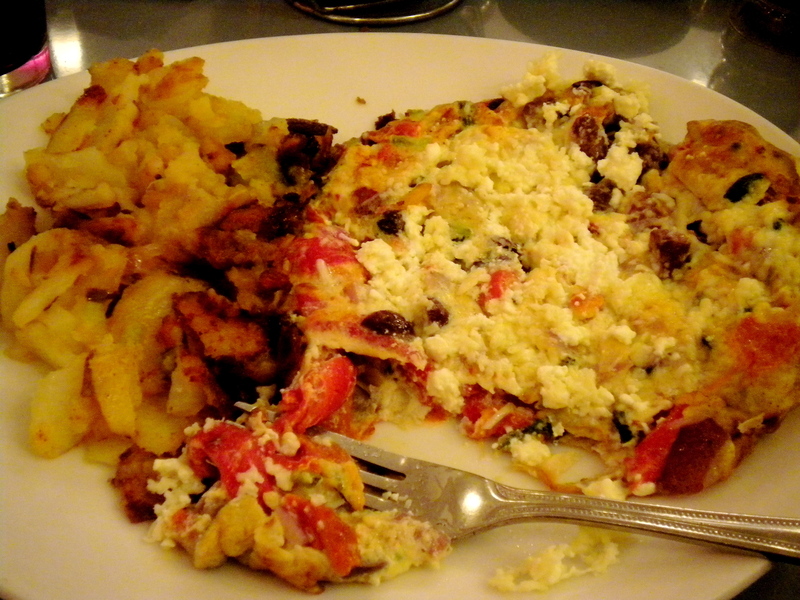 We both ordered omelets, and my egg white Mediterranean one was delish but a little on the oily side. I also gobbled down all of my potatoes, because my mom and I were chatting and having a good time and it just happened. I left feeling on the overly full side, but it was fun to go to a diner that is willing to branch out in its cuisine (not that I don’t love a good traditional diner tuna melt). Friday morning started off with a good cuddle from our family dog, Scout. It was the perfect way to start the day. Then it was off to the doctor, which is never too fun, but it’s always good to get that yearly check up crossed off the to-do list. Afterwards, I headed back to my apartment where I was able to enjoy the rest of my day off. I got a lot of errands out of the way and finally sent back the broken scale. Then, I had an awesome session at the gym. I rocked out two miles (that’s twice what I could do last week!) and ran the second one all out (for me) at 8 minute pace. I absolutely love running as hard as I can and getting a good sweat on. I rounded out my gym sess with abs, leg drills, and some foam rolling. Friday night, I was charged with finding a place for Chris, Yara, Yara’s friend from work, and I to go to dinner. The great thing about NYC is people always say that you can find whatever you want to eat. So I decided to test this theory and typed in exactly what I wanted into Yelp. The search terms “pizza wine” lead us to this amazing restaurant: Pastita. Low lights, large tables, vintage décor, and they don’t care if you stay for hours. My type of place. We all split the yucca fries, because Yelp said they were a must. They were good, but I don’t like fried food much, so they weren’t really my thing. Chris and I split a thin crust mushroom pizza and a salad with avocado slices and an amazing creamy dressing. I think avocado in a salad is my new favorite thing. This place is somewhere I will definitely return to in the future. Saturday morning started with my first Pilates class. I bought a Groupon on Friday for unlimited classes at a Pilates studio for only $55. This is a great deal, considering one class is normally $20. The studio is a great set-up and reminded me of where I took ballet classes when I was little. I really enjoyed the class – it was challenging and relaxing at the same time, if that makes any sense. Saturday night, Chris and I celebrated Valentine’s Day Night 1. I plan Valentine’s Day, and he plans our anniversary which is a week and half later. I like to carry out celebrations, so we celebrated Saturday night and then again tonight. What can I say? I’m a kid at heart. 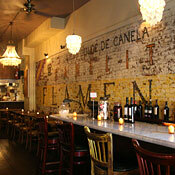 We started off with Thai food in the West Village at Pinto. We have both been craving good Thai food for ages, and every time we order it in, it comes out thumbs down. Not the case with Pinto. We started with a crunchy mushroom app that came with a jalapeño dipping sauce. Chris also ordered a Thai ice tea that was “make your own.” They gave him the tea, cream, and syrup in separate glasses, and then he combined them to his preference. Pretty nifty. For dinner I ordered crab fried rice in a young coconut. The presentation was fabulous and the food was yum. Chris enjoyed his go-to Thai dish of spicy noodles with beef. Thai craving satisfied. We then walked over to Sweet Revenge, which is an adorable place that does cupcake and wine and cupcake and beer pairings. The place is warm and inviting and the owner works behind the bar and chatted us up. Even though it was really busy, we were able to get a seat at the bar. We split two cupcakes: Crimson and Crème (red velvet) and Dirty (chocolate with a dark chocolate ganache). They Crimson and Crème was both our favorites. 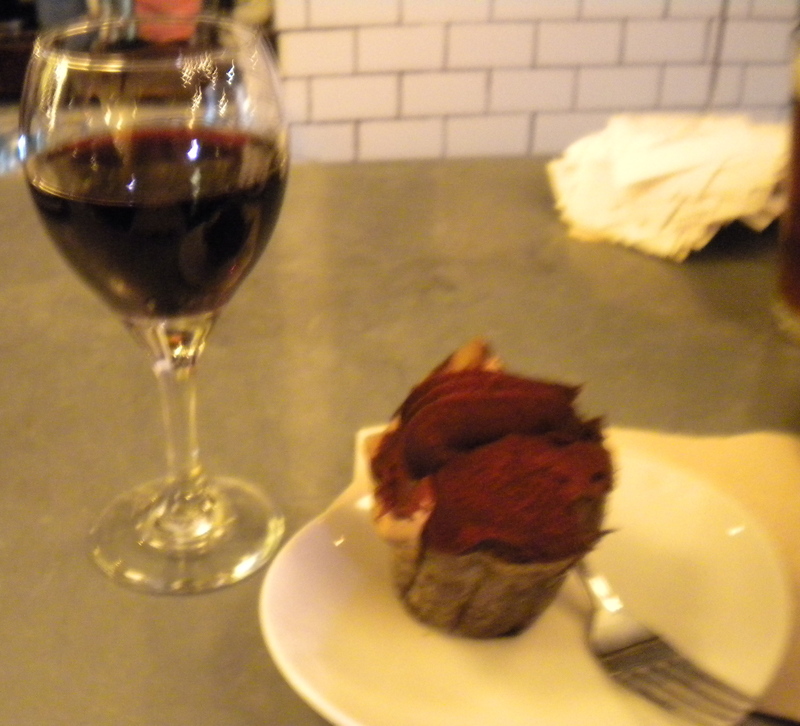 The wine pairing really did bring out the cupcake flavors, too. I would very much recommend this neighborhood gem, but don’t go with more than one person since seating is hard to come by. 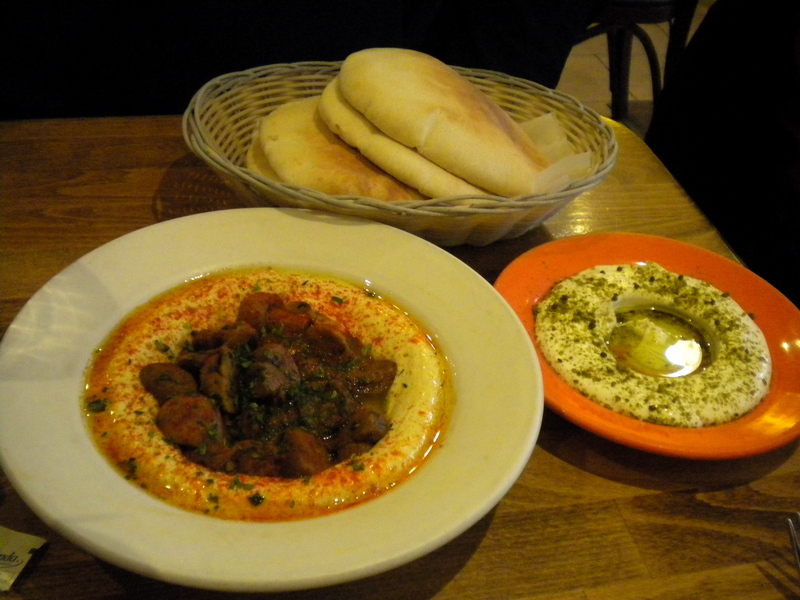 Because Chris and I were in the midst of the best eating weekend ever, we rounded off Sunday at the Hummus Place. I have a true love for hummus. I am also a hummus snob and don’t enjoy a lot of the hummus in the States. Hummus Place has amazing hummus. 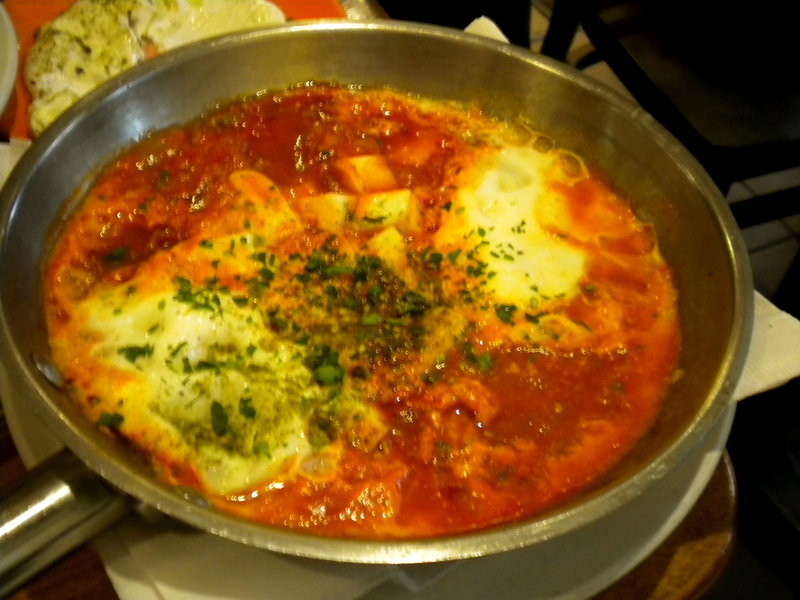 We ordered the mushroom topped hummus, labneh with zatar, and shakshuka. For me, this type of food doesn’t just feed my belly, but it also feeds my soul. This is food that with every bite I am warm and happy and satisfied. 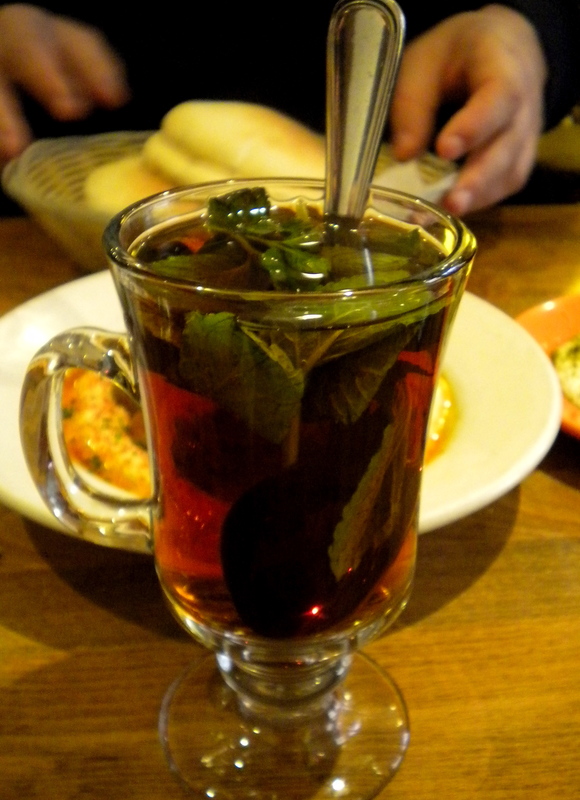 I paired my delicious meal with a mint tea. I may have to try to make this at home. Hummus, labneh, and warm pita. 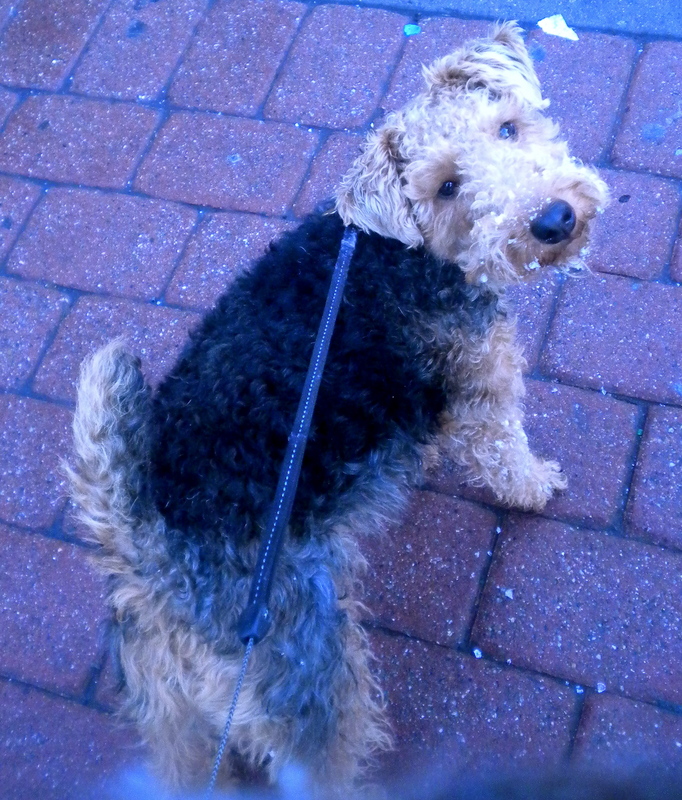 After lunch, Chris had to go into work, and I spent my time walking around the Upper West side. I ventured into Banana Republic and used a gift card to purchase a fun spring blouse. When I made it home, it was time for the dog park, massive apartment cleaning, and the gym. I ran two miles and did some arm weights. It was the first time I ran two mile straight (Friday I took a two minute walk break in between miles), and I was proud of that accomplishment. I ended the evening baking a heart shaped Red Velvet cake for Valentine’s Day Night 2 tonight. This was an extremely long post to catch up on my weekend of being a bad blogger. Thanks if you made it to the end! That was my middle school jam. Right now I am crushing hard. On spring clothes. Beautiful warm weather spring into summer clothes. I am over the cold and one of my ways to deal with cold weather is to pick out all the lovelies I want to add to my wardrobe when the sun shines warm once again. The best part about picking things out early is that I can do one of my favorite activities: clothing stalking. It works like this: 1) Pick out the full price item you want 2) Look for coupons for that item. 3) Go back to the store every so often to see if the item has gone on sale. 4) When said awesome coupon or sale appears, buy! It works well for me most every time. I haven’t been able to wear jean shorts for some time, but I tried these on yesterday and they fit well and looked good, too. I will be looking for that Gap 30% off coupon that comes around every few months. I love Antrhopologie, but most items are out of my price range, but this price point is good. This just may have to be added to my wardrobe. I am a big fan of ModCloth. This little dress would look great with some flats. I am the worst about picking out tops. I wind up having a million skirts and nothing to wear with them. This top from Ruche is dainty and fun at the same time. My old American Eagle mini skirt was tossed when I thought I would never lose the weight I had gained. Now that I am back into my old pants size, I want a new one. Target sundresses are always the best, though they tend to only last a season. Still, for under $20 that’s fine by me. Payless for the win! These shoes are fun and look like they would be good for walking around the city. I enjoyed the price comparision here. 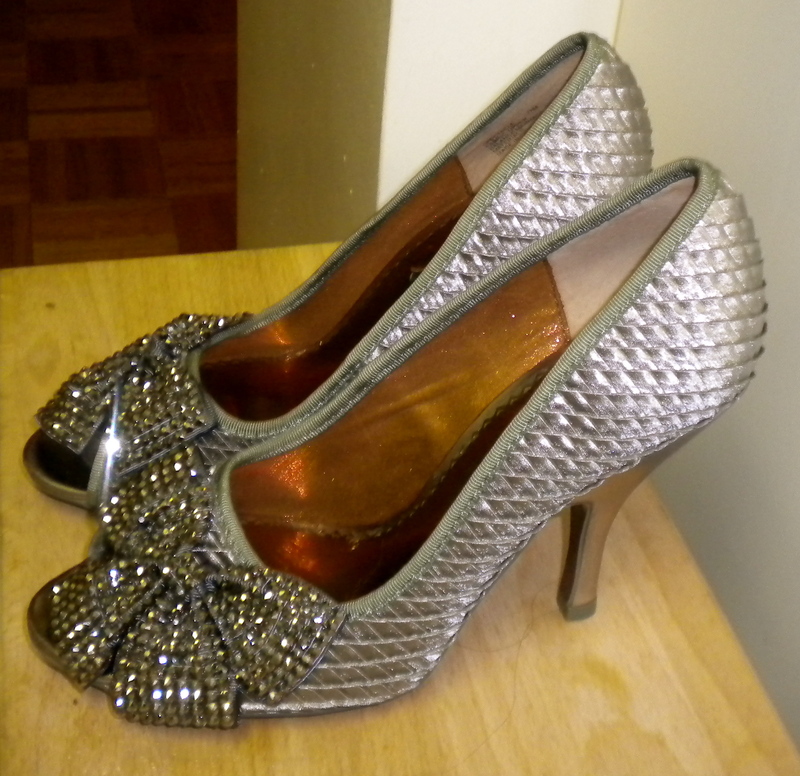 I owned these shoes in silver last year, and wore them until they were dead. Now I am excited to pick up a new pair! What clothing crushes do you currently have? What are your favorite stores to shop in? Before living in Upstate NY I didn’t even know who Alan Jackson was, and now I’m quoting him in post titles. Oh, how I wish NYC had a country music station. Thankfully, there is Pandora. But, the thrill is back. What thrill? The thrill of wearing your old clothes. The thrill of losing enough weight that you get to go shopping in your closet. It’s been a while since I could fit into some of my clothes, but I refused to give them up in the event that someday I would actually lose weight. Well, some day is here. Today, I am wearing my favorite jeans circa 1L year. They were a little tight then, but now they are more than comfortable. And they make my bum look good. There is nothing more fun that getting new-ish clothes without actually having to pay for them. I am having lots of fun realizing that I can wear things that I haven’t worn in a few years. I still am scared every time I go to zipper a pair of jeans that wouldn’t even button in September. Every time they zip up, and I realize they are comfortable, I get so thrilled. I also have started wearing some shirts that were too small earlier in the year. I am officially a Medium top again! What milestones have you achieved lately? 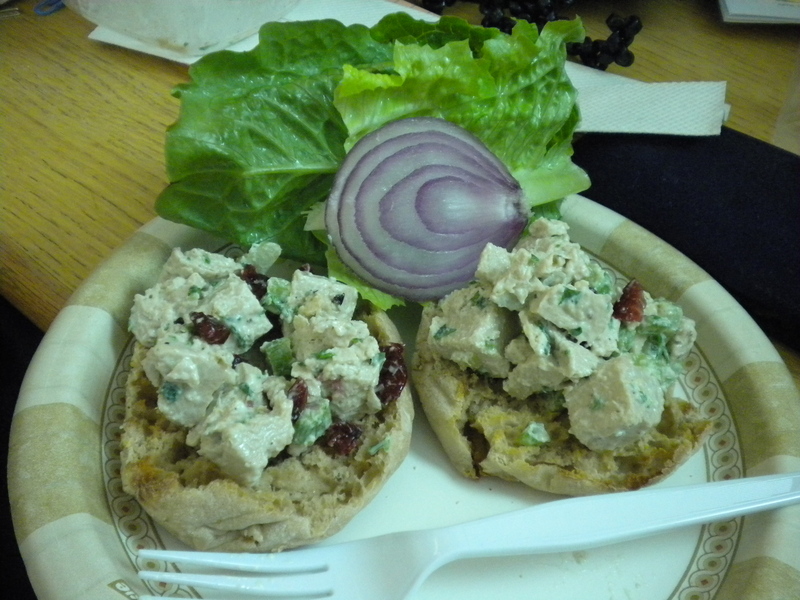 Lunch yesterday was half a container of Whole Foods mock-chicken salad mixed with dried cranberries served on a low-fat English muffin with tomato and lettuce. I paired it with Garlic and Onion Soy Crisps. The mock-chicken salad is one of my favorite things to eat, and I got a container this past week for only $2.50. Score! 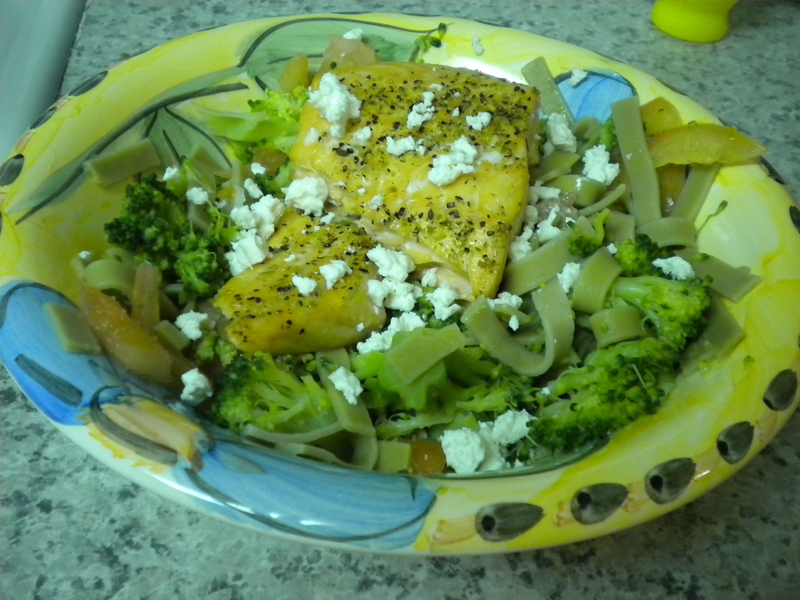 I mixed the spinach pasta with the salmon and added diced tomatoes and steamed broccoli. Of course I topped the whole thing off with some lemon juice, garlic powder, and feta. A yummy, satisfying meal. 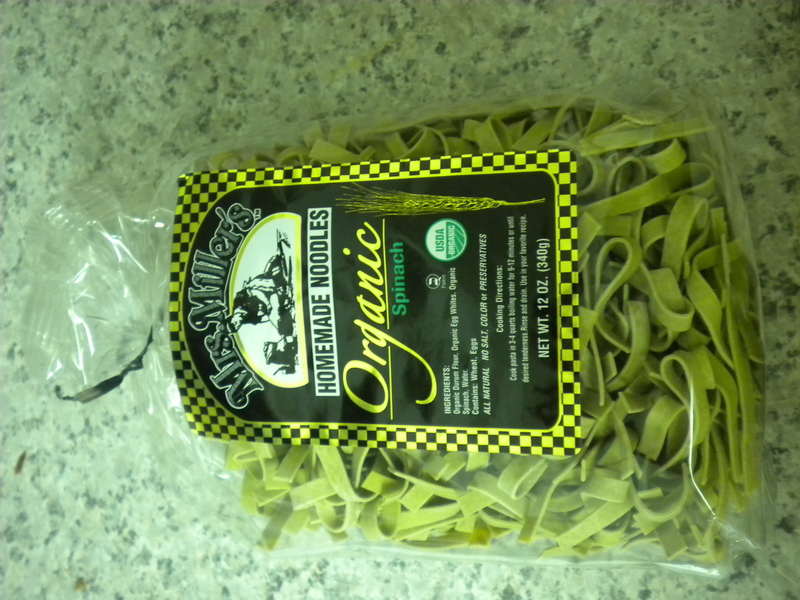 I’m happy I tried out a new type of pasta. I will be purchasing it again. What new foods have you enjoyed trying out? 1X Monthly: Chris and stock up on dry goods and home necessities once a month at Target. During this trip, we pick up rice, couscous, oatmeal, soups, beans, cereal, Crystal Light mix, and the extras like dried cranberries and dark chocolate chips. Basically, we get anything non-perishable that will still be as tasty at the end of the month as it was at the beginning of the month. We also stock up on home goods, such as toilet paper, paper towels, napkins, cleaning supplies, dog supplies, etc. Going to Target for these products is helpful, because their dry goods are much cheaper than anywhere else nearby. By stocking up for an entire month, it also forces us to prioritize what we really need to buy, since we have to carry all our purchases during a 25 minute walk back home. 1X Weekly: Every Sunday, I have gotten into the habit of visiting my local produce market. It is a fabulous place that allows me to eat fresh daily. There, I pick out my veggies for the week. Every week, I try to plan my “big cooking” meals ahead of going and then also pick up my always-used fruits and veggies and anything else that speaks to me. The best part about this place, is no matter how much produce I buy, it always comes out to approximately $11. This week I picked up the following goodies: romaine lettuce, a tomato, a Spanish onion, sliced eggplant, a butternut squash, green grapes, and gala apples. Buying fresh produce weekly is wonderful because it is healthy and delicious. It also allows me to stay excited about cooking, because I feel incentivized to use up all my produce weekly and try out new recipes. As Needed: Chris and I live right next to a nice supermarket. The only issue with it is that it is usually overpriced. Still, we get items there that cannot last a month, on an as needed basis. This includes cheese (their feta is surprisingly cheap, so we usually have feta), milk, eggs, fish, bread or whenever we simply need something extra on the spur of the moment. Though not cheap, it is wonderful to be able to pick up whatever we need quickly. As Needed: There is also a nice health food store nearby. I will stop there every once in a while when I have a craving for some veggie meat or need to restock on my Annie’s soups or ½ naked popcorn. They have the best prices for both products. Stopping by a special health food store is always a fun adventure, because it is loaded up with new products I always want to try out. So why do we shop around so much? Simple, to save money. It would be easiest to just go to the local supermarket, but we save so much money by breaking up our trips in this manner. My recommendation is get to know your neighborhood markets and keep an eye on the different prices for the products you usually buy. If going to two stores instead of just one can save you money monthly then it’s worth the extra trip. Plus, if you live in a city, it’s extra walking time, so you can rack up bonus exercise. What is your food shopping strategy? My meals were pretty random today. I went on a shopping trip to Target yesterday and bought a whole bunch of goodies off my food shopping wish list to play with so they will be making apperances. Breakfast was the usual. For lunch I had left over pea soup (mmm mmm good), but I knew that it wouldn’t keep me satisfied on its own, so I paired it with some dried cranberries. 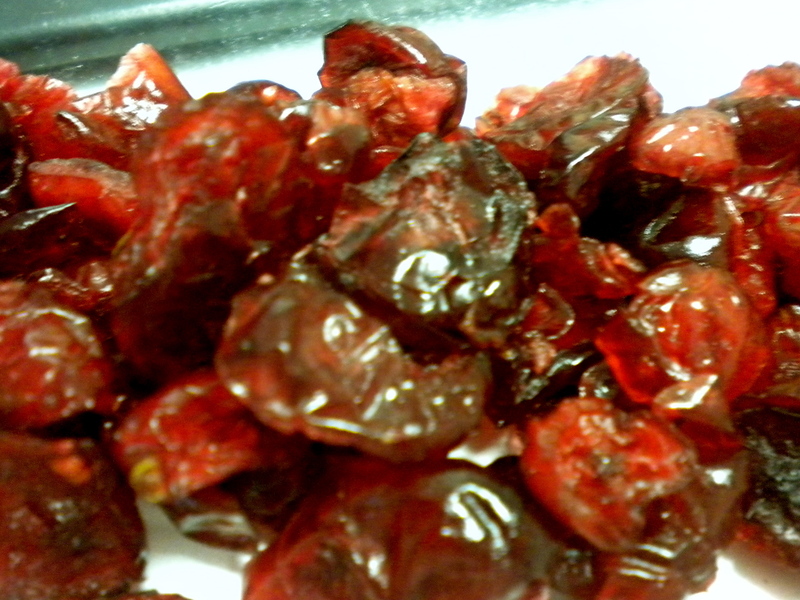 Why do dried cranberries look so scary up close? 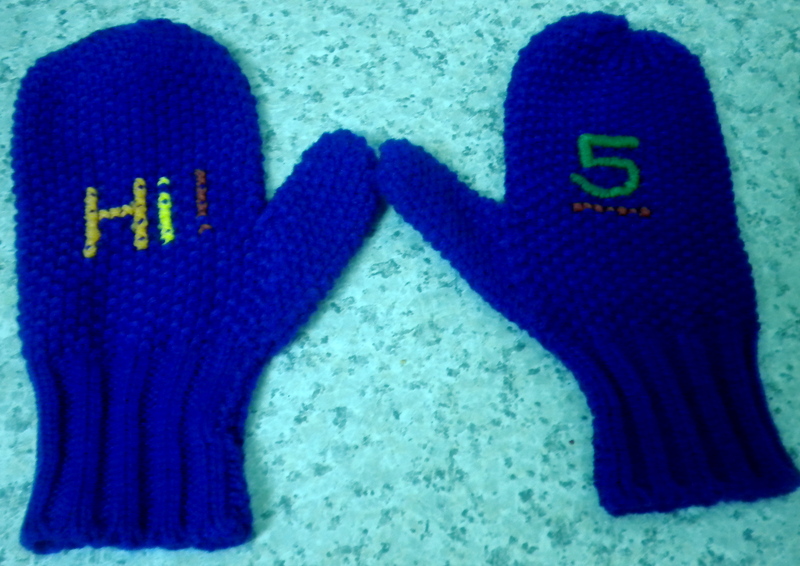 Self high-five mittens! $5 I'll try to take a clearer picture later. Literally, awesome. $3 at Old Navy. Great shopping success! 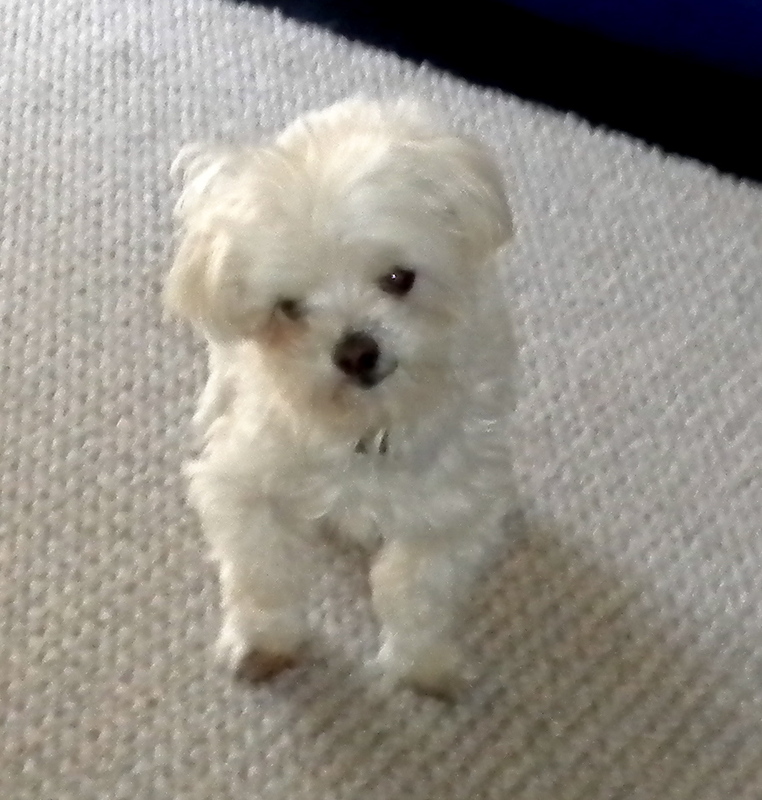 When I came home, I weighed in and lost .6lb this week. Not a great amount, but since I can’t work out until I am given the go ahead by my PT any loss is appreciated. For dinner, I was feeling experimental. I wanted mac ‘n cheese, but I knew that I needed to stick to the 1 cup serving size, which would likely leave me hungry soon after. So I decided to bulk up my mac ‘n cheese. 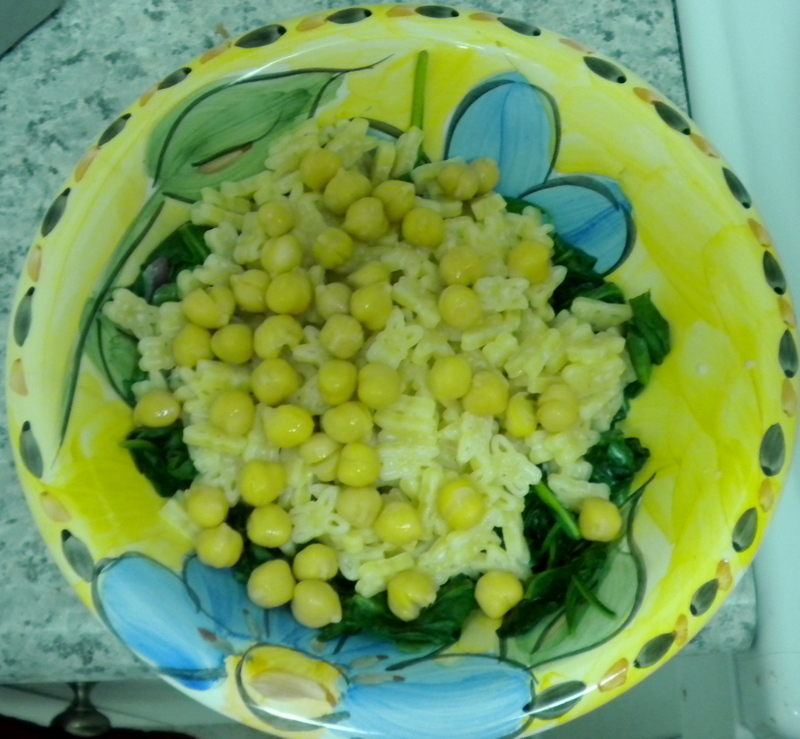 I served it on a bed of wilted spinach mixed with chickpeas and topped with a little feta. It satisfied my craving and left me so full that I couldn’t finish my bowl. 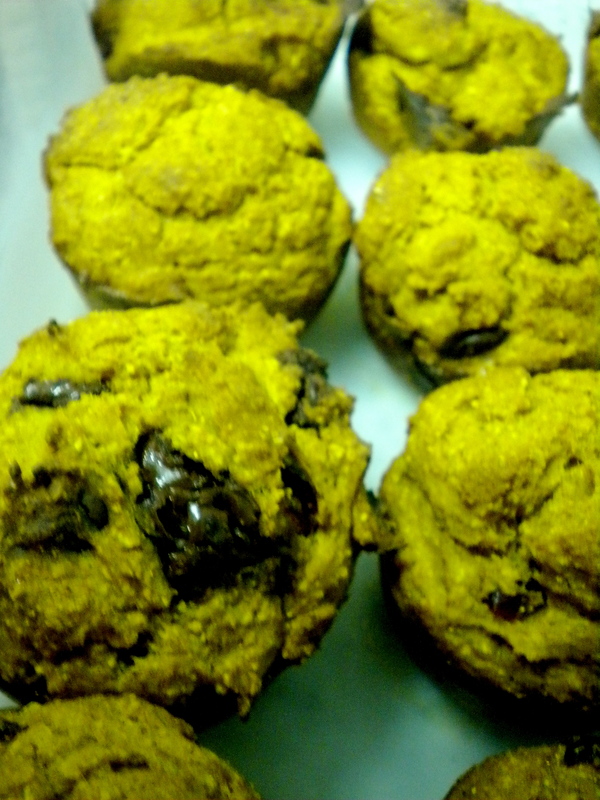 After dinner I got to work making Pumpkin Oat Muffins. They came out very moist (why do so many people hate that word? ), and I may have already downed one. I promise to share this yummy recipe soon! What are your most recent awesome shopping finds?